In the fall of 1933, Vassar College initiated two experiments in cooperative living. These initiatives, one in existing residence halls (Raymond and Main) and the other in a reconfigured Blodgett Hall, were part of an effort to help students lower their costs during the financial crisis of the Depression. Many Vassar girls were determined to finished their education, and by doing some of the housekeeping chores they were able to save some money and remain at school. The plan called for students in Raymond, Main, and Blodgett to earn an aggregate of $22,000 during the 1933-34 academic year. Considering that the cost of tuition, room and board was $1200 per student, the projected savings were significant. The project was administered by Eleanor Dodge, who was Warden in 1933. The changes made in Raymond and Main in September 1933 were actually fairly modest. Kitchen help was still hired to prepare meals and heavy cleaning was still done by maids. Thirty Raymond freshmen took part in the program, and they assumed responsibility for room cleaning, waitressing, and message taking at the front desk. They were also given sweeping and polishing responsibilities in the hallways and common areas. 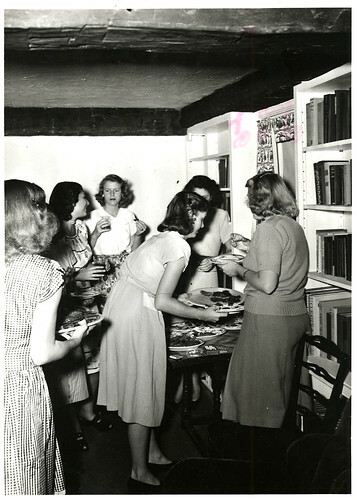 Dorothy Raybold and Frances Bryan, Director and Assistant Director of Halls respectively, organized the student jobs, and the girls came to campus several days early in the fall to clean their rooms and learn cleaning and waitressing skills. They were also instructed in how to run the elevators. Every student was required to serve as desk messenger for two hours a week, and there was a weekly examination on emergency procedures and social regulations. A more extensive experiment in cooperative living was also begun in the fall of 1933 when Blodgett Hall was converted to allow student residence. A group of upperclass students moved in and shared all responsibilities for meal planning, table setting, cooking and cleaning, with a reduction in room and board costs. Blodgett Hall had been designed as the home of the Department of Euthenics. The first group of students who moved in joked that, while the building was appropriate for the study of the betterment of living conditions, it was unsuitable as a cooperative dormitory. A student might have to go through several bedrooms in order to get to her own, and the bathroom was located near the boiler room next to a room filled with biological experiments. Nevertheless, the students appeared to enjoy the experience and worked diligently to make the project successful. I have heard more or less of the efficiency developed by cooperative house keeping in Blodgett Hall – especially efficiency regarding menus, food combinations, etc. May I, therefore, ask that you, or a committee of your choosing take over for me the question for our dinner on May 7th, and relieve me of it entirely? I would suggest four courses, which might include a soup, meat, salad, and dessert. It if is possible to find such a thing I hope you will take advantage of the opportunity and have a meat course that you do not often have in Blodgett Hall, where I assume the broiling and roasting facilities are somewhat limited. I will be delighted and look in at the 'Blodgett Brawl' on the Saturday night following. Than you for the suggestion. President MacCracken and I did not venture into Blodgett that Saturday evening because from the laughter and sounds we heard we knew instinctively that something very important was going on, and we suspected dish-washing. We feared that some of the young men might get nervous at the sight of us and break some china, which we knew would be a calamity. Permit me to again say how greatly I enjoyed meeting the Blodgett crowd…. In 1938 the cooperative dormitory was moved from Blodgett to Palmer House. Palmer House was named in honor of Jean Culbert Palmer '93 who was Warden of the college from 1915 until her death in 1929. Ms. Palmer had encouraged students to earn a part of their college expenses, and naming the new cooperative dormitory in her honor seemed fitting. The two original sections of the house were barns built in the middle of the nineteenth century on a farm owned by the Wing family. 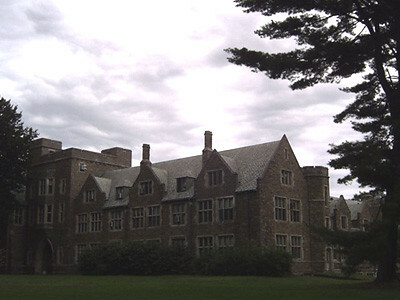 Vassar bought the farm in 1923, and it had been occupied by various faculty members until July 1938 when it was renovated in preparation for its use as a cooperative dormitory. An east wing was added to the structure during the summer, and the older parts of the house were redecorated. The sun parlor was fashioned into a "glassed-in study", and the exterior of the building was enhanced with pressed gravel walks, new landscaping and a picket fence. Twenty-thee students, mostly sophomores and juniors, moved into Palmer House in 1938. Two hundred and fifty dollars were deducted from their room and board expenses. The job shifts, shared by twenty two of the students (the 23rd was the president of the house who was in charge of general planning), were head cook, 2 assistant cooks, 3 dish washers, one table-setter, one table-clearer, one person in charge of odd jobs (pots and pans, floor cleaning, etc.) and one substitute who, in addition to their duties, was in charge of laundry and flowers. Each student worked for two weeks at a time and then had a two week "vacation." It became more and more difficult for the college to subsidize the cooperative living projects. In 1941, the administration considered closing the Raymond and Main projects for economic reasons. After considerable student protest and much discussion, Elisabeth Drouilhet, Vassar's Warden at the time, announced in a March 1942 issue of the Miscellany News that the Raymond students had voted to accept a plan whereby the house would run at cost. By terms of the plan, the college would no longer subsidize the students thirty dollars each, and they would earn seventy dollars apiece instead of the usual one hundred. Students were encouraged to earn the additional money they needed form other sources, and in addition, the program was opened to all students interested in cooperative living (not just those in financial need). The Palmer residents greatly enjoyed their experience in house, and it was seen as one of the most popular houses on campus. However, Vassar closed Palmer House in 1947, citing the follow reasons: 1) it was uneconomical to run, 2) there was an insufficient number of applicants, and 3) the students living there have a poor "health record." President Blandings expressed regret over the closing, ad Mrs. Sam Lewisohn, chair of the trustee committee on undergraduate life, was quoted in the Alumnae magazine as saying "I believe firmly that a co-operative house is a necessary addition to any American campus… It can be an important and living demonstration of democracy in action." In 1950, Dexter Ferry gave the college $200,000 to build a new cooperative house. Mr. Ferry, whose sisters donated money to build Alumnae House, made the gift, "in grateful appreciation of all Vassar has done for the Ferry family." The building was designed by Marcel Breuer and opened as a cooperative student residence in the fall of 1951; both Ferry and Breuer spoke at the Ferry House dedication in October of that year. Coincidentally, the Mary Conover Mellon House Fellow program was initiated that same year, and Ruth Timms was appointed House Fellow of Ferry House. 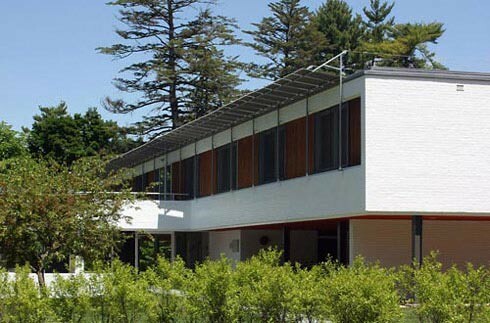 Since 1951 Ferry House has been a cooperative living option at Vassar College. For a couple years the building was used for transfer student housing due to lack of applicants for the cooperative option, and on at least one other occasion the building was closed briefly because students living there were not keeping it clean. However, for most of its half-century existence Ferry has made a valuable contribution as a residential option at Vassar College. In 2006, Ferry House residents held a reunion, and Vassar Quarterly was there. Henry Noble MacCracken, "Blodgett Hall: Purpose and Fulfillment", Vassar Quarterly, Fall 1938 issue.